Three more men who pleaded guilty to their involvement in an airport bid-rigging scheme were sentenced yesterday, dodging jail time because of their cooperation. Yesterday's sentencing brought closure to a joint federal-state investigation started six years ago over an airport official receiving kickbacks for awarding bids without competition. Businessmen Arthur Inada and Roy Yoshida admitted to billing their bids over the necessary amount, for kickbacks to airport officials. Harry Shibuya, former maintenance supervising director at the airport, admitted to awarding contracts to only one business under instructions by his superiors. Their confessions resulted in the federal conviction of Dennis Hirokawa, former superintendent of airport maintenance, and Richard Okada, former Visitor Information Program director. The two businessmen asked for leniency, saying they became "sucked into" the pay-to-play environment allegedly caused by Hirokawa and Okada. "It seemed like they were helping you out," said Inada, president of Blueprint Builders. "Times were hard. They made it like they were your friends." Inada's attorney, Nelson Goo, asked for a lowering of the $25,000 fine, stating Inada was the first contractor to cooperate, spent much in attorney's fees and hours working with the case, repaid $25,000 to the state and still owes money in restitution, which is yet to be determined. Circuit Judge Dexter Del Rosario said if he did not impose the fine, Inada would only pay $350 to probation and the crime victims compensation fund, a sum "woefully inadequate" for the crime. Inada also was put on five years' probation, but does not have to serve community service because he is retired. Yoshida, who owns Yoshida Auto Paint Shop, deferred his plea and only needs to pay $6,500 in restitution, $1,000 to the court and $150 to the crime victims compensation fund. Shibuya's attorney, James Koshiba, said his client's evidence included a Post-It note of contractors he was told to award bids to. Despite his superior's orders, Shibuya requested competitive bids at first anyway, knowing the law, Koshiba said. He was later scolded and intimidated into rigging the bids. Koshiba also noted that Shibuya received no kickbacks or benefit from the scheme. "In this case he took nothing and even took in early retirement," Koshiba said. 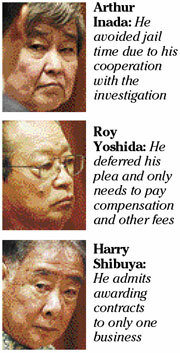 Shibuya must only pay $2,000 to the court and $200 to the crime victims compensation fund. One more sentencing, of CBS Electric President Bert Shiosaki, is scheduled for later this month, said Deputy Attorney General Christopher Young. Shiosaki has admitted making about $8,100 in kickbacks in the form of "political donations" or other favors to airport officials.